But don't be too sad for the twelve-cylinder sedan's demise. The Mercedes-AMG S65 Final Edition will be limited to just 130 examples worldwide and comes decked out in one and only one stunning color combination: a high-gloss Obsidian black metallic, with bronze trim and an interior done up to match. The 20-inch alloys are finished in the same matte bronze as the lower air inlets and quarter-panel trim. The tailpipes are finished in glossy black to match the paint, and special bronze AMG crests adorn the C-pillars. Inside, it's all black Nappa leather with copper top-stitching and bronze-threaded carbon-fiber trim. There's even copper-colored ambient lighting to bathe the cabin in a thematic glow, and unique finishing to the engine cover under the hood. The engine is, after all, the essential element that Mercedes is celebrating with this Final Edition. Having already phased out the SL65 and G65, the German automaker will soon offer its V12 engine only on Maybach models. The discontinuation of the S65 may seem like sad news, but before you reach for the tissue box, consider the following. For one, the AMG S63 – though less powerful – is quicker off the line (mostly because of the nine-speed automatic and all-wheel drive that can't accommodate the V12's torque). 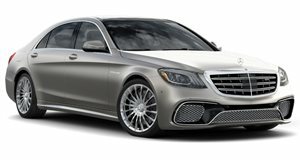 And the Maybach S650 has the same engine as the outgoing AMG S65 and is only slower off the line because it's bigger: where the S63 and S65 ride on the 124.6-inch wheelbase (stretching 208.5-inches from nose to tail), the Maybach's wheelbase measures 132.5-inches (for an overall length of 214.7-inches). The kicker, though, is that both the S63 ($149,550 MSRP before delivery) and S650 ($199,900) are cheaper than the S65 ($232,550). The long and short of it is that, if you want performance, the S63 isn't going anywhere but forwards. And if you want the V12, the Maybach is the one you'd probably want anyway. So we won't be shedding many a tear for the S65's demise. But if you want to snap one up before they're gone, you'd better act fast before all 130 Final Editions are gone and the model's put out to pasture altogether.